CARY, IL, Oct. 9, 2017 – The Healthy Nurse, Healthy Nation Walking Challenge will be in full force at the ANCC National Magnet Conference in Houston Oct. 11-13. 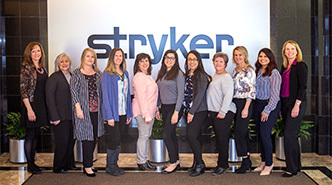 The challenge begins Wednesday at 10:00 a.m. CT and runs through Friday at 11:00 a.m. CT. Stryker is sponsoring the walking challenge and will share an interactive booth space with Sage Products, sponsor of Healthy Nurse, Healthy Nation, where participants can check in and earn steps. “Sage’s ongoing sponsorship of the HNHN Grand Challenge highlights the importance of having healthy nurses serving as role models for each other, as well as for the patients and communities they serve. I’m proud that as part of Stryker, we can come together and show support for our nation’s caregivers,” says Jeff Gorton, Senior Director of Sales at Sage Products. To participate, attendees can download the Walking Challenge app in the Apple App Store or Google Play Store. Registration can be completed by using the activation code: Stryker17. The person with the most cumulative steps will win free airfare, hotel and registration for next year’s ANCC National Magnet Conference held October 24-26 in Denver, CO. The ANCC is challenging all participants to reach 50,000 steps during the challenge. The first 100 people to register for the challenge will receive a wristband provided by ANCC Magnet. To help reach step goals, participants can “scan-in” at the Stryker booth (#915) each day and receive the following bonus steps: first day scan, 1,000 bonus steps; second day scan, 1,500 bonus steps; third day scan, 2,000 bonus steps. All prizes will be awarded at the Stryker booth (#915) on Friday, Oct. 13 between 11:15 a.m. and 12:15 p.m. CT. The Walking Challenge is part of Sage’s ongoing sponsorship of the American Nurses Association’s Healthy Nurse Healthy Nation Grand Challenge. The Grand Challenge, which launched in May, is a movement designed to transform the health of the nation by improving the health of America’s 3.6 million registered nurses. For more information, or to sign up for the grand challenge, visit the Sage website. Sage will also be previewing the company’s latest innovation at booth #915. The soon-to-be-released management system for urinary incontinence introduces new innovations into the incontinence category.